Do you need to design PCR primers? Perform multiple sequence alignment? Search for SNPs? Identify gene mutations? Build pathway models? Discover protein binding sites? Analyze high-throughput data? The HSLS Molecular Biology Information Service can help you with all of these questions, and more. 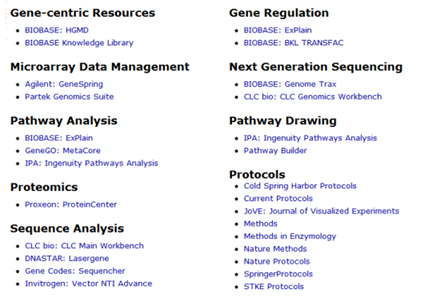 HSLS provides access to a wide variety of authoritative “omics” software, databases, and protocols for molecular biology data analysis. These resources are available to all University of Pittsburgh and UPMC affiliates upon registration. Some of the resources are Web-based and password-dependent, whereas others involve downloading software and may be limited to campus computers or require remote access. Specific software access requirements are provided online for each licensed tool. HSLS does not charge a fee for access to these resources by qualified users. The full array of tools is available through the MolBio Licensed Tools Web page. The tools are organized in categories based on function; click on the name of each tool to find additional information, including a brief description, registration instructions, noteworthy features, and additional links. The HSLS Molecular Biology Information Service offers hands-on training workshops for many of these licensed tools. The online Molecular Biology Class Schedule shows the meeting times, locations, and descriptions of all workshops offered during the fall 2011 semester. Contact Ask A MolBio Librarian with suggestions for additional tools or workshops.